A recent transportation study has found that when you text while driving an automobile, your eyes are not focused on the road for almost five seconds every time. This means if you are texting while going about 55pmh, you are not paying attention to the road for about a whole football fields length. Just in the year of 2013 along, it is reported that more than 3,100 people were killed, while another 424,000 road travelers were injured in crashes that were caused by distracted drivers operating motor vehicles. As much as a vehicle is a form or transportation to practically everyone in this country, it can also be a deadly weapon. A vehicle with someone not focused on their driving, who is behind the wheel, is like someone directing a one-ton rocket with four wheels. 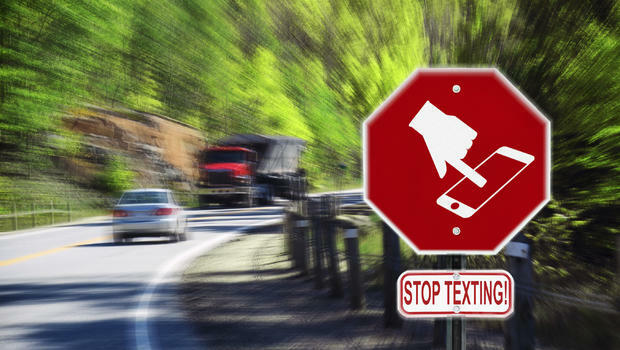 Currently, there are forty-six states along with the District of Columbia, that have some form of ban on texting while operating a motor vehicle, per the Governors Highway Safety Association. Some of these laws are Primary offenses, while some are only secondary offenses. The difference between the two, is a primary offense allows an officer to cite you for the offense whenever he sees it, while a secondary can only be cited if the driver has been stopped for something else. The four states without these kinds of laws are Montana, Missouri, Texas, and Arizona. With that being said, they all do have some sort of regulation for either school bus drivers, or people who are under either twenty-one, or eighteen. Young and inexperienced drivers cause the biggest threat to potential harm of others while driving, especially when they are not focused on operating their motor vehicle. According to this compare comprehensive car insurance site, the penalty accompanied with using your phone while driving varies by state, but here are a few examples from around the country. These penalties very from somewhat minuscule, to severe, and could have quite the effect on your overall life in the short-term, as well as long-term. In the state of California, the fine for your first offense is just $20. It goes up to $50 for all other offenses after your first. Though the violation does appear on your driving record if convicted, it does not add any points to your driving record. In all, the total for these fines can rise substantially, up to three times the original amount, once other assessments are included along with fees. The state of New York’s first time offender penalty ranges anywhere from $50-$200, with a fee that can be as much as $93. The second offense leads to an increase of $250, with the third offense and so on, climbing to $450. You will also be given five driving points on your driving record If you are found guilty of this. Alaska, who has the toughest penalties for cellphone use while driving, charges offenders with a misdemeanor. This can come with a penalty of up to $10,000 along with a year in prison. If your actions injured someone else, you are subjected to up to $50,000 in fines, as well as, up to 5 years in a state prison. If someone is found to have been using a cellphone that caused an accident, and the victim died because of it, that person faces a charge of up to $250,00 dollars, and a maximum of twenty years behind prison bars. These penalties will make any person think twice before using their phone when they are behind the wheel of an automobile. READ How Cloud Computing Aid Businesses To Save Time and Money? In relation to this, some cities have taken action against cellphone use while driving in their own communities, enacting laws of their own. There are states however, that don’t assign points to your driving record along with fees. These states are Delaware, Iowa, Louisiana, Pennsylvania, Tennessee, and California. Although, citizens and representatives alike are working on getting this changed. Being convicted of cellphone use while driving doesn’t always effect your insurance rates. This depends solely on where you live, and where you were cited at. There are four states that do not permit insurance companies to raise your rates because of this, and those states are, North Carolina, Washington, Massachusetts, and Idaho. If you have been cited for using a cellphone while driving multiple times, and points on your license were issued with the citations, you run a risk of having your license suspended, along with a hefty number of fees and fines. As far as insurance companies increasing rates with relation to a texting while driving citation, the formula used to figure out the effects are different and vary from company to company. They consider, your overall driving history, and if any, what patterns seem to be on your driving record as well. As you can see, there are many factors which affect car insurance rates. Since we all text, it is important to research this topic in your state.